If you are a nerd of a certain age (as I am), you’re probably already familiar with Douglas Adams’s classic novel of sci-fi whimsy, The Hitchhiker’s Guide to the Galaxy. And if you’re not, I envy you, because you still have this remarkable series to experience for the first time! Originally conceived as a BBC radio series in the ’70s, the Hitchhiker series expanded to include six books, a movie, and a text-based adventure game. In HG2G, English Everyman Arthur Dent discovers that his friend Ford Prefect is not so much a quirky bloke as…an alien. And more to the point, an alien researcher for the best guidebook in the world, the Hitchhiker’s Guide to the Galaxy. This timing is convenient, as all of Earth is about to be destroyed to make way for an interstellar bypass. Better hit the road! 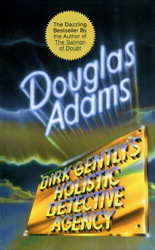 After the wild success of Adams’s Hitchhiker series, he developed a new one, beginning with Dirk Gently’s Holistic Detective Agency and continuing in The Long Dark Tea-Time of the Soul. (Sadly, Adams passed away before completing a planned third book in the series.) 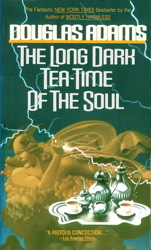 These novels share his British sensibility and humor, as well as his fascination with the workings of the universe, but Dirk Gently moves about in time as well as space. A psychic who can predict everything but the winning lottery numbers, Dirk Gently has a “holistic” approach to crime solving that’s tested when a million-year-old ghost wants him to go back in time and prevent the ghost’s murder. Dirk Gently has his origin in two Doctor Who serials Adams wrote (one of which wasn’t aired initially), so it’s no surprise that things get a little timey-wimey, as it were. So this weekend, why not try a little interstellar (or inter-epochal?) adventure? And wherever you go, don’t forget your towel!